Read it here or download it for free from Barnes & Noble, Kobo, iTunes, 24Symbols, Playster and Draft2Digital. You’d think the luckiest woman in the world would also be the happiest. Drinking isn’t improving my mood. I slam my glass on the sticky counter as hard as I can. In the mirror behind the bar, just visible in the dimness, I watch a long shard of glass fly up into a slow turn. It comes down point first. A man I hadn’t noticed behind me yelps and runs for the door, clutching his wrist. I want to bang my head on the bar. Lena catches my eye and winks as she clears up the broken glass. I sigh. Tell me something I don’t know. I raise a hand for a second beer and slide a ten-dollar bill across the bar to pay for it and the broken glass. The lack of control is getting to me these days. When I’m down and at my worst, I’m not convinced it’s a good trade-off for fabulous luck. I used to practise gratitude. I really did. I floated through life in a sparkly golden haze and shared my luck as best I could, unobtrusively of course. Lately, it’s been starting to get to me. What I wouldn’t give for a smidgen of bad luck. A small negative consequence for something I’ve done. Last week I was driving home from grocery shopping. Traffic was unusually light (of course). Yet another light turned green just ahead of me, and frustration poured through me. I wished just once something would go a little bit wrong. I pounded my fist on the steering wheel — and hit the horn by accident. A truck that was crossing the centre line veered back across its own lane and jerked to a stop at the curb. The driver stepped out looking pale and rubbing his eyes. I took back my wish. Last month, frustration came over me when I was about to scramble some eggs. I hurled two of them at the kitchen floor. It felt so good, I emptied the carton one by one until there was a slurry of goo and eggshells on the floor. Thinking my luck had changed, I didn’t stop smiling all through cleaning up the mess. Not until later, when I heard about the egg recall. Last year, I broke my own heart when I walked out of my wedding. My fiancé called me his good luck charm one too many times. Turns out he was gambling when I wasn’t around — and he saw me as a way to keep the money flowing. Everyone said I was lucky to get away from him when I did. On the surface, I don’t have anything to complain about. Things are great for me. I’m well off and could be incredibly rich if I wanted. I don’t feel right buying lottery tickets after that first big win, though. I know my luck is a gift. Complaining about it seems wrong. After all, it could be the reverse — I could be unlucky. Deep down, I can’t help wondering, do people see me? Take my last attempt at dating. At first, he assumed he was on a lucky streak; then he noticed he was only lucky when I was around. He suggested we go to the casino. He asked me to help pick his lottery numbers. 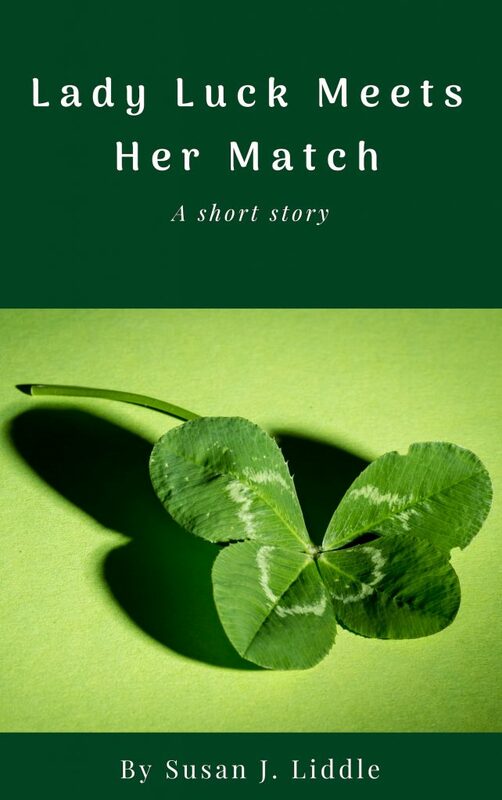 By the time I stopped answering his texts, I knew all he saw when he looked at me was his personal four-leaf-clover. I snap back to the present and fiddle with the stack of napkins Lena has set down in front of me. Maybe she’s worried I’ll have another outburst. She reaches towards me to set my drink down, and I see motion out of the corner of my eye. A man around my own age sits down. Somehow he bumps Lena’s arm. He apologizes, and the three of us watch my beer glass flip out of her hand. Beer arcs up gracefully and lands in the tiny bar sink. The empty glass thuds down on the stack of napkins. Lena picks it up and turns to the tap. “I’m Jonah,” the man says, holding out his hand. I smile and grasp it firmly. It’s a good strong handshake with a little zing of energy. Lena places my beer on the side away from Jonah and sets down one for him, along with a fresh stack of napkins. He picks up his glass and smiles slightly. “Here’s to luck,” he says. “What kind of luck do you have?” I ask. He gestures to the leg of his dress pants. “So you always have bad luck?” I ask. We sit and drink quietly for a few minutes. I start to slide off the bar stool to head to the bathroom. “Excuse me for a moment,” I say. At the same time, Jonah turns around on his stool and knocks me sideways. He reaches out to steady me. I can’t help smiling. I’ve never been knocked sideways before. He apologizes and lets got of me. His elbow knocks his cellphone off the bar and it lands in my purse. He leans forward to get his phone and my head bumps his nose, knocking his glasses askew. They fall off and land in my jacket pocket. I start to grin, and put my hands on his cheeks. I hold him still and lean in. I’m trying for a kiss, but I botch it because I can’t stop laughing. This time all our parts fit together well. Really well. I’m sure I feel tiny bubbles of energy fizzing between us. We come up for air at the same time. “I think my luck —” he says. “— just changed,” I say. This is one of my all-time favorites! Just hit my serendipity bone in the right place! Thanks for reading, and your lovely comment. Thanks for reading and for your kind comment!